Redbet casino has gone crazy! Just open a new account on Redbet and get 100 Free Spins without deposit on Starburst for selected countries (Sweden, Finland, Germany, Norway) and 25 free spin no deposits for the rest of the world. Your free spins will be automatically credited upon registration and you can use them on our video slot Starburst. All you have to do is open the slot and start spinning! Open a new account with Redbet Casino! But how about 200 or even 500 free spins on Starburst? Well all you have to do is make a small deposit and these free spins are yours. Make a first deposit of at least €20,- and you will receive 200 free spins. Make a first deposit of at least €50,- and you will get 500 free spins. 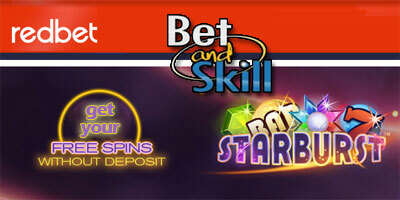 And if you make a second deposit of at least €20,- you will get another 100 free spins. So as you can see, with only a small deposit of €50,- you are able to get 625 free spins on Starburst! "Redbet Casino: up to 100 free spins on Starburst - no deposit required"